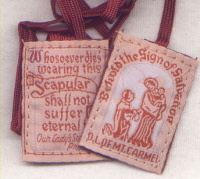 Beautiful embroidered brown images, washable brown scapular. Sturdy cord! See details for free pdf leaflet download Out of stock - sorry!